Committee for the analysis of information content, established by Ordinance no. 2279/2017/GR of 11 October 2017. Analyze information content to be purchased by the University Library (BU) and carry out studies to support the purchases. Committee mainly composed of BU librarians (appointed by Ordinance no. 998/2018/GR of 2 May 2018) in partnership with UFSC Communication Agency. • assist in events organized by other UFSC units or by the external community at BU. A Community of Practice is a group of people gathered around a common topic of interest. At BU, the emphasis relies on the actions related to its Training Program. Promote the interaction among librarians involved in the BU Training Program as a way to encourage the exchange of information and experiences, the improvement of techniques and the development of new solutions for this service. Committee mainly composed of BU librarians (appointed by Ordinance no. 1202/2016/GR of 25 May 2016). Partnerships with other sectors and agencies that can contribute to its objectives will also be established. Create and implement a support service for the research and management of raw research data at UFSC. Committee that promotes actions and studies on the ethical and epistemological foundations for producing, disseminating and accessing reliable information. Its actions involve the verification of information sources, the strategies for combating misinformation and the ethical practices of sharing and creating information, especially in the digital environment. Among the topics discussed by the committee are fake news, post-truth, alternative facts, fact check, information literacy, media literacy, reflective thinking and critical reading of information. The committee is formed by BU librarians and other internal and external collaborators (appointed by Ordinance no. 1996-A/2018/GR of 29 August 2018). • formalize or improve courses for the Research Support and Information Competence Service. The committee for the Creation of a Literary Book, established by the extension project no. 2015.7523, is working on the development of a book entitled “Entre estantes e (entre) tantos: memórias de uma biblioteca”. The book aims to recover the memory of the University Library through personal accounts of its staff members, which will be adapted into literary texts. The Collection Development Committee aims to define and implement criteria for the development and upgrade of the library collections. The committee includes representatives from the UFSC Academic Schools, as established in the Ordinance no. 1160/2018/GR of 23 May 2018. The committee, composed of BU librarians, aims to evaluate UFSC Institutional Repository and implement improvement actions. Partnerships with other sectors will be established according to Ordinance no. 2110/2016/GR of 14 September 2016. Evaluate UFSC Institutional Repository and implement improvement actions. Committee established by Ordinance no. 2345/2018/GR of 31 October 2018 to develop projects that meet the various needs of the Library sectors and to search for submission calls to raise funds for their execution. To write down projects that meet the needs of the University Library and that are suitable for submission calls. The UFSC University Library is implementing knowledge management in all of its library units. This work has the support of a librarians committee (appointed by Ordinance no. 997/2018) and a partnership with the Graduate Program in Knowledge Engineering and Management at UFSC. The committee’s work is guided by the GC@BU Framework – an outcome of a doctoral research – which is composed by several elements with specific verification criteria. 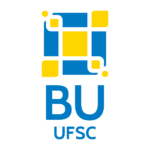 Implement knowledge management practices and projects based on the CG@BU Framework, aiming to improve the flow and the mapping of information and knowledge in the UFSC Library System. Committee established by Ordinance no. 01/BU/2014 to work on the University Library’s website management. This work started in 2013 due to the need of redesigning the BU website so as to better organize information according to the progress of services and resources offered by the Library to the community. After one year of work, the committee’s team was formalized by Ordinance no. 01/BU/2014. After the redesign of the website, a new ordinance was issued (Ordinance no.1603/2016/GR of 12 July 2016) to keep on with the management of the website. • deliberate about the incorporation of new visual, technological and informational resources. The committee began its work in 2015 due to the necessity, identified by the Knowledge Management Committee, of mapping and registering the processes of activities carried out by the BU collaborators. The committee was established by Ordinance no.1844/2015/GR of 27 October 2015. • register the activities executed. Temporary committee (4 months) composed of BU librarians and faculty members of the Department of Information Sciences (appointed by Ordinance no. 1385/2018/GR of 22 June 2018). Study the aspects related to plagiarism and research misconduct in order to elaborate an institutional guidelines proposal. The committee was established by Ordinance no. 2399/2017/GR to work on the University Library acquisition processes. Work on the acquisition processes. The committe is formed by BU librarians and administrative assistants, a faculty member of the Information Science Program and an IT analyst (appointed by Ordinance no. 1272/2016/GR of 2 June 2016). Study the appropriate information technologies for the activities of the University Library.